Last week, I went shopping with my husband for some affordable lights for our house. I had a pretty good idea of the style of lights I wanted, so I thought we’d be in and out of the stores fairly quickly. We looked at dozens of lights, disputed the merits of all of them, and we argued about what kind of light bulbs to put in them. Seriously … who argues about light bulbs? First I’ll show you the lights we want to replace, then I’ll show you some of the lights I’m considering. We’re working on a pretty tight budget, so we only focused on affordable farmhouse lights both in stores and online. 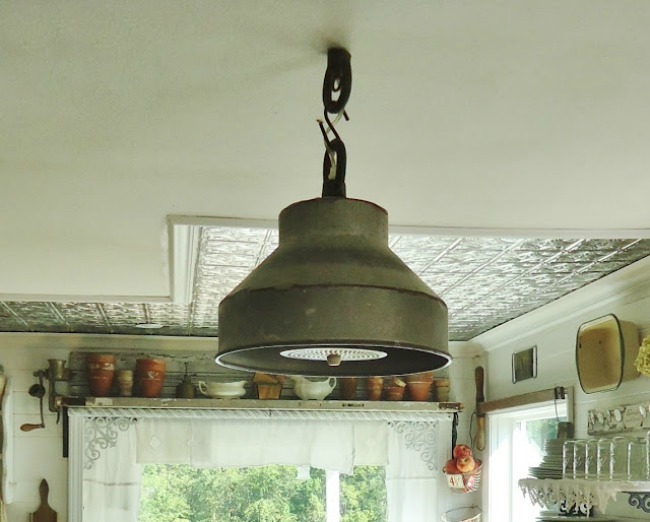 We’ve had this repurposed milk can strainer light in our kitchen since we remodeled the room, and both of us agreed we were ready for a new light. It’s available in my online shop HERE. 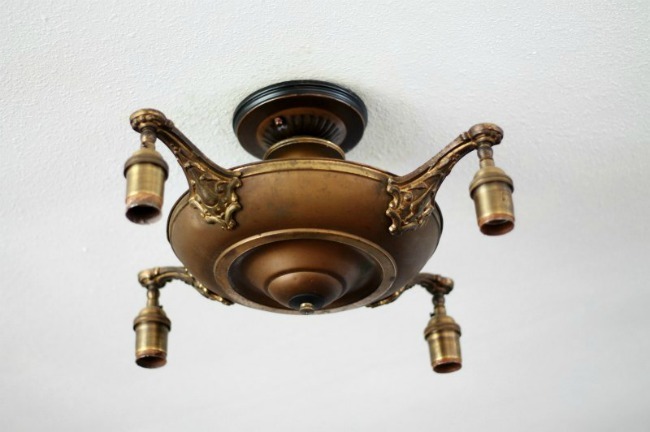 We are also replacing this antique brass light (shown below) in our living room. It has beautiful details and patina, but doesn’t really go with my farmhouse style. We need another light in the living room for a wall that doesn’t have one now, and three more lights in our bedroom. So, here are my 15 favorite options. Five of the ten cost over $100, but that’s because they are AMAZING, and worth every penny. None are over $300. The other ten each cost under $50, so they truly are very affordable for almost any budget. I’ve included a nice selection of lights that would work throughout the house. In a future post, I’ll share which lights we selected. 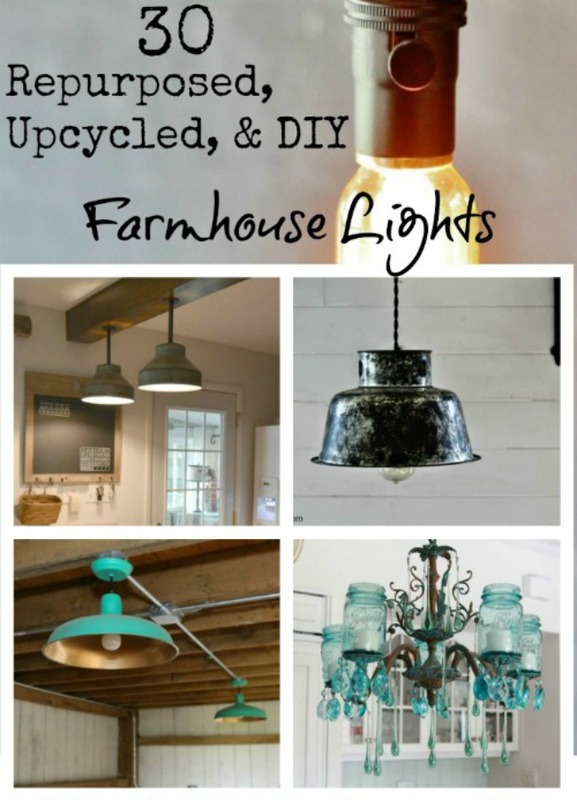 See my picks for Repurposed, Upcycled & DIY Farmhouse Lights HERE. 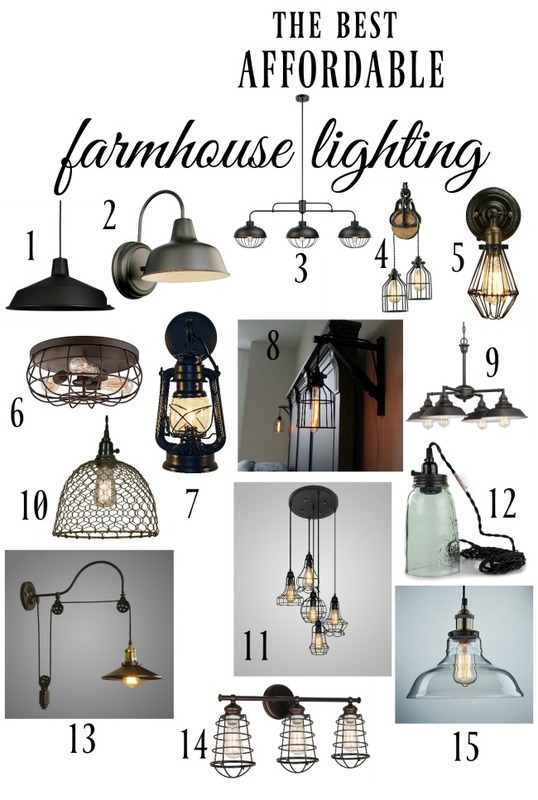 WOW, you’ve really put together an awesome collection of choices for lighting farmhouse-style! It makes me wish we needed new lighting, too, but not now. 🙁 I personally LOVE your repurposed milk can strainer light, but understand that you might get tired of it after many years of owning it!! My favorites from the ones you posted are the chicken-wire-covered bulb and the industrial gooseneck with pulley sconce. I think the last one is a bit expensive, but it’s worth it if both of you agree on the need for it, and how long you’ll use it. In the long run, it will pay for itself, I guess. GOOD LUCK WITH MAKING TOUGH DECISIONS, ANGIE!! You’re right – it is a tough choice, and I’m having a hard time narrowing it down to just 3 or 4 that we need. We did buy two though, and hope to have them both installed soon. Looking forward to seeing what you choose! Lighting makes a big difference in a room…the look and the function! Beautiful inspiration lights! Thanks Linda! We did pick two lights and my husband has one of them installed, but I’m having a hard time deciding on the ones we’ll need for our bedroom. There were so many I really loved. Number 1, number 6, and number 10 are my favorites. You put together a great selection, Angie! Number 1 I would like to hang in our back entryway as I have sort of a rustic barn theme going in there. I was thinking of the chicken wire one for our kitchen ceiling light, but I don’t know if it would take a bright enough bulb. I would also like a small pendant light for over my sink, but didn’t see one in your collection. I’ve been contemplating changing all the ceiling lights in my house for a while now but just haven’t done enough research to find what I want for all the rooms. Time, time, I need more time! Thanks so much for sharing the fruits of your research! Very helpful. Thanks Naomi! We did buy a few lights for the living room. My husband installed one of them and hopefully he’ll get the other installed soon. I can’t wait until our bedroom ceiling and walls are closer to being finished, so we can get the new lights. I’m having a tough time deciding which ones to get though. I like 10 for a kitchen, or 3 with the dark patina in your white kitchen, especially over a long table. 9 for a living room. 5 for wall sconces and 15 for a bedroom. I van’t wait to see photos of your finished rooms. Thanks Michelle. We have a way to go before the bedroom is finished, but hopefully we’ll have the living room lights and new kitchen light installed soon. We are planning to build soon and I’m looking at lighting. I love all of these! Thanks for the ideas!!! Love the farmhouse style and your choices of light options! I have 2 suggestions for you to keep in mind: 1) remember that the amount of light you need is as important as the style of the light itself; and 2) think about how hard or easy a light will be to keep clean or change bulbs. Great tips, Darla! We were frustrated that some of the lights we love won’t take bulbs with high enough wattage that we’ll need, so it is important to check that before just buying because you like how one looks. Lights are such an important choice! Shopping with Hubbys is so difficult sometimes! They don’t always have the vision…. I do hope you pick lights that tickle your fancY! Good luck on your search. I recently went looking for a new light in my craft room….need to have a flush mount there….there are no cute lights that are flush mount! I ended up putting extra bright LEDs in there and that suffices…. These are fabulous options. I adore the farmhouse style and lights can be so difficult to find! Thanks for sharing with us at Funtastic Friday!